Thirty years ago this was now of our favorite campsites. There was only a very difficult road access and the only signs of development was a path lined with rocks. Sailors had covered a tree there with mementoes of their voyages. Now however there are houses built on the north side and a decent road enables vehicles to gain access. The tree is still covered with signs of mostly sailboats that have anchored here. Looking out towards the sea the many variety of rock formations still make the place quite magical. We have had several days of calm weather and today is no different. We continue to head south today paddleling next to colorful red rocks We are hoping to make it to Punta Mangles. The wind picks up, not from the North, but from the South. Not a dangerous situation, just one that makes us put effort into forward momentum. We arrive to our destination and check out the ruins of what once had been the makings of a fine hotel. 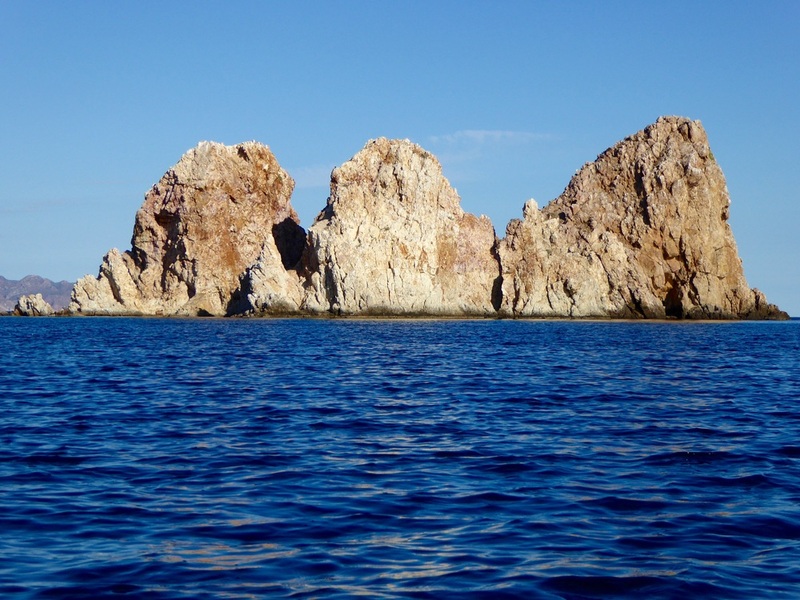 Once again the harshness of Baja's environment has caused a failure in the hotel's success.